Browse and order from our current ‘collectors’ selection here. Apart from Tokaj, Somlo is about the only Hungarian white appellation producing wines that keep for decades. Their outstanding longevity is not due to sugar ( as opposed to Tokaj ) – Somlo’s stability comes from the extremely high volcanic minerality-content and a characteristically high acidity structure. We know about this mostly from old scriptures, telling us how the only dry whites of the Austro-Hungarian Empire that survived the many months shipping to the New World came from Somlo – bill of ladings dating back to the 18th Century prove regular shipments leaving the tiny volcanic hill bound to New York. We can also read about how on the 1896 Budapest World Exhibition 20 and 30 year-old Somlo wines were handed out as prizes. What we can not really know, however, is how exactly these wines must have tasted – as commercial bottled wine production stopped after the IInd World War. Hungary’s communist regime mixed all grapes from Somló into mass-produced, containerised wines in a nearby Balaton Wine ‘factory’, destined to quench the thirst of our Soviet comrades. Bottled Somló wines started to appear on the market only after the fall of the Berlin Wall, but virtually no bottles remain from the handful, early small producers of this time. This is the reason why Somló Wines older than 10 years old are so rare to come by – they were simply drunk at the time and surviving bottles are snapped up by collectors almost instantly. Those lucky few having already tasted such wines will without fail testify that each year adds a new virtual “diamond carat” to a wine from Somló: similarly to full bodied Burgundy terroir whites, our wines only get better with age. In fact, because of the above history, we do not even know when they reach they peak – we only hope that there will be enough of them to taste in years to come to find out. Apart from Tornai Winery’s museum, Bela Fekete and Imre Györgykovács are the only still active and living Somlo winemakers, by whom one can still find high enough quality old wines that do justice to- and show the true potential of Volcanic Somlo. We consider ourselves outstandingly lucky, as around Christmas our shop usually receives a few bottles of these miracle-survivors to sell. Our 2017 January collectors portfolio offers quite a fair bit of Somlo History, it is an outstandingly rich selection this year. Still, more importantly, if you are not one to keep pleasures bottled up, go for it: open them. These wines will certain to give you a once in a lifetime tasting experience. We recommend that you serv old Somlo wines at a slightly higher temperature than you would your normal whites, at around 16-17 Celsius. You may also want to decant them, although we like to slow their breathing process by simply leaving them uncorked for a few days in their bottle. (yes, uncorked. un-chilled, even. be brave and be amazed…:) ) The initial brutal, wet-earthy, flintstoney and ashy-volcanic rock-taste as well as the arrogantly overpowering minerality will, we promise, in a few days time mellow out. Leave enough time for the original fruit and the winemaker’s style to reappear and be enchanted by a Somlo summer long gone by. 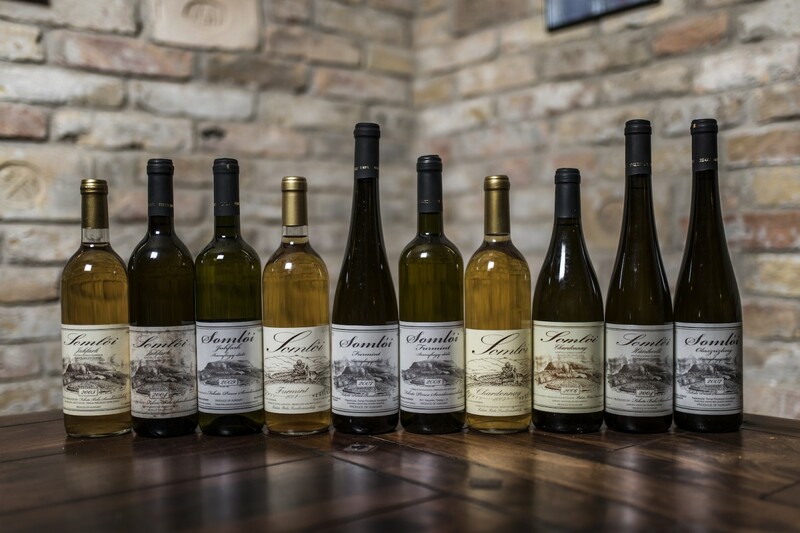 By being patient, and re-tasting a decade – old Somlo wine during a period of more than 2 days you will be more likely to understand their amazing complexity and unparalleled versatility. with flat-rate Nationwide and International Delivery!